Last year (June 2011), it was announced that many of the original Valiant Univerve comics characters would be returning to comic shops this Summer including XO Manowar, Harbinger and Archer and Armstrong. I don't know that I talked about this news here as previous returns of the Valiant characters have been less than spectacular. Also, I had my doubts the marketplace would receive them any better than it did Jim Shooter's recent Dark Horse foray with Solar, Man of the Atom. Don't get me wrong. I love the old Valiant comics (at least a certain era of them) but how many failed attempts have we seen to revive old comic properties in the last few years? The timing on this couldn't be better as this issue will be coming out the week of Free Comic Book day and the weekend that the Avengers movie will (hopefully) be driving tons of lasped comic book fans to their local comic shop. Anyone else looking forward to checking out this first issue? Based on glowing recommendations from Pierre and a new appreciation for the storytelling in The Walking Dead, I started reading Robert Kirkman's Invincible from Image Comics. I'll won't go into a in depth review of the series here today but I will say I enjoy it. I had been putting off reading the series because I think in my later years, I have developed a prejudice against Off Brand Superhero comics. I think a lot of that is due in part to the wave of Youngblood and (later) Authority clones we have seen in recent decades. However, that has not always been the case with me, and over the years, I have tried out a lot of Off Brand Superhero comics. Here is what I consider my Top Ten Favorites from decades past with a few honorable mentions at the end. For the sake of this article, I am defining Off Brand Superheroes as Spandex wearing characters. How many are you familiar with and who would you add to the list? While this series sometimes meandered during story lines, there is no denying the brilliance of Steve Rude's artwork. And Mike Baron often took the stories in some fun and unexpected places. This might seem like a bit of a cheat to put this here, as some people might categorize this title as Space Opera or Sword and Planet. This series is Jim Starlin in his prime on a series he put a lot of thought into. Along with Nexus, this is one of the longer running series on this list with a lot of amazing crescendos throughout the run. Before he became a multimillionaire ;) writing Fables for Vertigo, Bill Willingham created his take on the Fantatic Four back in the 1980s. Great artwork and zippy storylines made this a fun title to read. Unfortunately, financial problems with Comico resulted in a mess later. The Ultraverse brought us a ton of great titles. This was such a great setup. Strangers on a subway car all get superpowers due to an unexplained power bolt and later we get a mystery as someone seems to be killing off members of the group. As with many titles on this list, this group had a bouncey publishing history. Still, Dave Cockrum's signature design style always made it worth reading when you could find it. This should probably be up higher in the list, but sometimes John Byrne's plotting just leaves me cold. However, if you are even remotely a fan of John Byrne's work in any form, I would strongly suggest sampling this series. This title spanned multiple versions and eras of the title character as it kept going so it's a bit hard to really review as a whole per se. I will say that it is perhaps the finest examination of the enduring influence of heroic legends and the permutations that can develop around such myths. Like the Ultraverse, Valiant produced a lot of great comics during their short tenure, so it was hard to pick a favorite easily. To be honest, XO Manowar and Harbinger were really the two I liked best from that line, but Doctor Mirage fits my prescribed definition of an off brand superhero better. I've always liked the focus on the relationship between Doctor Mirage and his wife in this series. It sort of reminded me of the banter between Nick and Nora Charles in the Thin Man series. Also, even back then, it was easy to see that Bernard Chang was a real superstar. Is there anyone besides me that remembers this series? Probably not. Even my memory of the series is vague, but what I DO remember is that the art was a wonderful facsimile of Jack Kirby's style at a time when most comics were shunning that style. Here are a few that I also liked but didn't make it into the top ten. There was only one issue of this published which was a damn shame as it struck me as one of the cooler comics to come out of the Dark Horse Comics Greatest World. If I had to describe it, I would say it was Ultimate Challengers of the Unknown with a bit of Suicide Squad tossed in. Other series (X and Ghost) would have much longer runs, but they didn't captivate half as much me the way this first issue did. I only got one issue of this (because that was all I could find) but I really liked it. In writing this article, I discovered you can buy them digitally (from DriveThruStuff ) so I may try a few more issues in that format. Here is an oldie but goodie from Atlas comics. Interestingly enough, this savage claw bearing character had a lot of attributes that would later make the Wolverine so popular. If only Atlas had known. Well, that felt pretty all inclusive, but I would be delighted to hear from any of you guys as to which of your favorite off brand superhero I missed! I was recently listening to a Podcast about the Lee/Ditko Silver Age Spider-man run, and it got me to thinking. 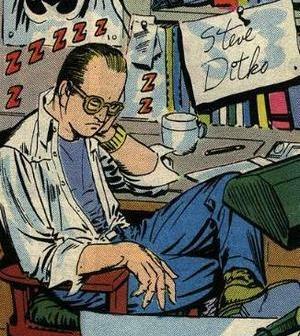 People rightly acknowledge how fluid and dynamic Ditko's art was, but rarely do I hear them say anything about his design sense. As a conceptual designer, comparing him to what his peers were doing at other companies, he really thought outside the box in a number of ways. I would like to go over some of these over the course of a few articles here in time, but will start with Spider-man's mask today. 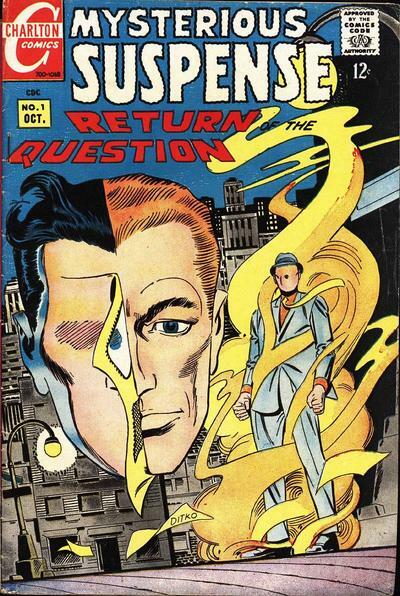 With the classic web-head look, I think Ditko introduced the concept of the completely masked Superhero (at least at Marvel, if not for the Silver Age in general) Is there another superhero whose faced is completely hidden in a Silver Age comic at the time? 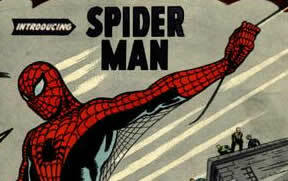 The only one I could come up with was Iron Man, and Spider-man precedes him by almost a full year. It makes for a striking visual with the exaggerated eyes and lack of mouth to give you insight into the character's thoughts. 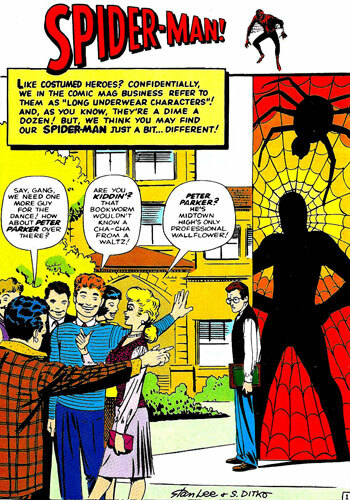 While it might be arguable how much this fully masked designed played into the popularity of the character, what is important is how much it adds into the transformation of Peter Parker into Spider-man. It completely removes any signs of the callow boy we are first introduced to at the beginning of the story. 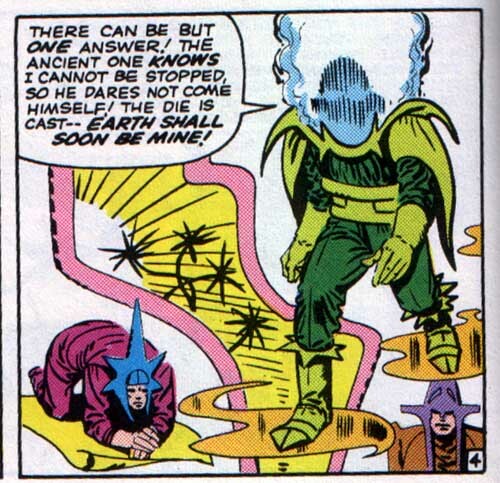 Later versions of Dormammu would add a mouth and more expressive eyes, which I think was a bit of a mistake because it removed some of the mystique and unapproachability* from the character. *Yeah, I'm not sure unapproachability is even a word, so feel free to suggest a better one. Last week saw the arrival of the first issue of the much ballyhooed AvsX mini-series - a bi-weekly Marvel Event that is going to run for the next 6 months consisting mostly of fights between Avengers and the X-men scripted by Brian Bendis. Now, most of the backlash against this series has come in the form of fans denouncing Event styled stories in general. I don't necessarily agree with that sentiment. I think comic Events are a bit like any other type of storytelling approach - they succeed (or fail) based on their own merits. With that said, I think AvsX is going to be another one for the Fail column and let me explain why. This is really how Thor talks these days? Even putting that dialogue in some faux Medieval font from Blambot doesn't shake the feeling that this line was left over from Die Hard 4. Is that what is passing for verisimilitude now? And I know Bendis isn't the only writer who does this (Paul Cornell is guilty of it in DC's Demon Knights) With dialogue like this creeping in at the onset, I wouldn't hold my breath that it will get better by the time we hit month 3 or 4. Hey, that's okay, you say because this series is going to be mostly action scenes, so who cares about the dialogue? Early on, a mysterious object from space clips off the top of the building scattering all the people inside to the four winds. Wow! People and debris falling every where! How will the heroes solve this problem? Well, Spider-man makes a giant web that somehow separates the people from the debris and saves everybody. All in the space of one panel break. Also in this early scene, check out how Thor and Iron Man handle a problem with a Jet that has lost a wing in the middle of the city. Iron Man uses an unspecified ray blast of some sort to just atomize the separated wing, and Thor creates a magical wind tunnel to capture the jet and guide it to safety. But Jim, you remind me, that's okay because comics are all about heroes using far fetched solutions to solve problems! Well, you may have a point, but I think the far fetched solutions in Silver Age Superman were often clever parts of a larger story with a twist to them. Here we just get one panel with no attempt to even rationalize the physics or abilities involved. With Thor, you can say it's magic and just sort of shrug, but that nonchalance has been expanded (by the writer) onto the Spider-man and Iron Man scenes as well. It's perfunctory at best and lazy at worst. Well, that's okay, because while Bendis may be weak on action scenes, he will come through on the fight scenes. I wouldn't bet on that. Check out this scene where Cyclops is just beating on Hope for reasons that are a bit unclear. Now, it's implied that he's training her for self defense here. However, if Cyclops is supposed to be seriously training Hope, wouldn't some form of martial arts be more effective? This scene, which runs several pages, resembles a bar fight as recounted by a guy who wasn't there. Like Thor's dialogue, there isn't any suggestion of a style other than Street Level 101. But, but...Bendis writes good character interaction scenes. What I predict will happen is that somewhere around July or August we will see a lot of buyers remorse as those fans who bought into the hype with this series start to realize it just ain't that good. 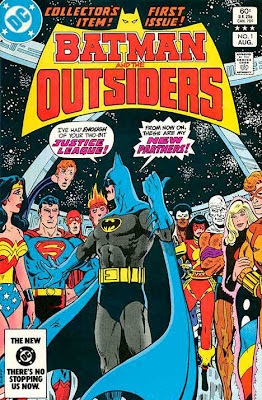 So last week I started reading the first incarnation of Batman and the Outsiders, and it got me thinking. Not about Mike Barr’s stories or Jim Aparo's adept art, but rather about the price, which was only .60 cents. In 1983 (the date of publishing) you could buy 5 comics for an hour’s worth of minimum wage ($3.35 an hour). As that was all I was making back then at the various jobs I was able to get at the time (Amusement park employee, Used Book Store clerk and Cafeteria worker), that economic relationship would have been of critical importance to me at the time. Now, however, with the price of comics running more like 2.99 to 3.99, you can really only buy, at best, 2 comics for an hour’s worth of work at minimum wage. I wonder if that relationship (5 to 2) might not be proportional to the amount of comics sold now? Meanwhile, movies [ http://boxofficemojo.com/about/adjuster.htm] have stayed in line with minimum wage, more or less, over the years. NOTE: I've heard that publishers used to keep the prices of comics artificially lower in previous decades than they do now. Can anyone confirm this?